It’s that time of year again! 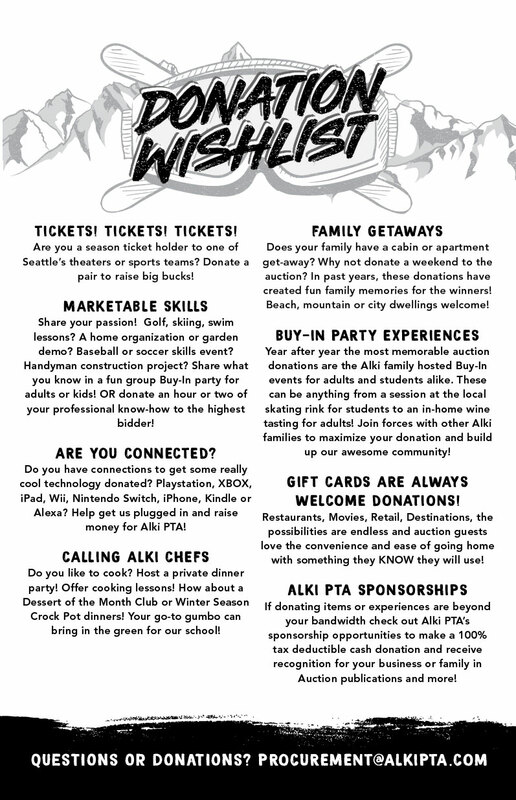 We are asking for your support of Alki Elementary PTA Auction on December 1st, 2018. The Auction is our biggest fundraiser of the year and the dollars raised from your donation will support vital programs, staffing and community building events that enrich the lives of our students. Donations of items, services, and gift certificates are all welcome and greatly appreciated. If you can support us with a donation, please complete this form Auction 2018 Procurement FORM. Alki PTA is a 501c3 non-profit (Tax ID# 91-1387438) and all donations are tax deductible as stated in the IRS code. Donors will receive receipts for tax reporting purposes. In addition, all auction donors are acknowledged in our online catalog which will be viewed by our community of 300+ families in the weeks leading up to the auction as well as our printed event program viewed by guests on auction night. You’ll also be listed among our generous supporters on our PTA website and weekly e-news bulletins. In short, you will be a celebrity in the Alki Elementary community and probably enjoy lots of good karma well into 2019! Questions? Please contact us at procurement@alkipta.com about donations. Not sure what you can donate? Check out our wishlist!